The PAC of billionaire activist Tom Steyer will begin running highly targeted ads in a single television market aimed at a single congressman all in the hopes of pressuring that lawmaker to issue a subpoena for President Trump's tax returns. "It's time to hold Donald Trump accountable, and we can do our part here in Massachusetts," the 30-second ad begins. "All we need is our congressman, Richard Neal, to be with us. Neal can subpoena Trump's tax returns and vote to start impeachment hearings against the most lawless, corrupt president in American history." The ad then goes on to provide viewers with Neal's phone number, urging them to call and voice their support on the issue. Neal, a Democrat, represents the state's 1st Congressional District spanning the western and south central portions of the state, which includes the Springfield television market where the ads will run. With Democrats taking the House majority after the 2018 elections, Neal became the chairman of the Ways and Means Committee. "It's not going to make anything move any faster or slower," Neal told the Boston Globe in response to the two-week ad buy just slightly north of $100,000. "Neal said he's proceeding with plans to request Trump's tax returns, which advocates say is authorized by federal law," the Globe report noted. "That entails drafting a legal rationale for obtaining them. With that done, a request can be made to the secretary of the Treasury, asking the IRS to turn over the tax forms. But no one expects Trump to turn anything over without a fight. So doing it right and carefully matters." The new ad represents the start of the third major tactical arm of Steyer's pet project, "Need to Impeach." Originally, through most of 2018, Need to Impeach was running television ads with Steyer as the narrator, while at the same time he hosted dozens of impeachment-based townhall discussions across the country. After Steyer announced in early January that he would not be running for president, he also said he'd be dedicating $40 million of his own money to boost the impeachment campaign. Close to the same time, he also told reporters that Need to Impeach would be tracking Democratic presidential contenders and trying to pin them down toward supporting impeachment. Now, the third part of that campaign is targeting Neal, but is also expected to take aim at a select few powerful members like Intelligence Committee chairman Adam Schiff (D., Calif.), Oversight Committee chairman Elijah Cummings (D., Md. ), and Financial Services chairwoman Maxine Waters (D., Calif.). 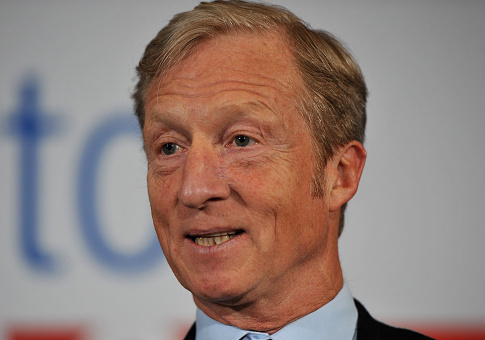 Last week, Steyer hosted a two-day impeachment "summit" in D.C., which culminated in the billionaire and dozens of his supporters fanning out through Capitol office buildings to deliver articles of impeachment to members of Congress. Steyer will also be hosting an impeachment townhall in Springfield next week to follow through on the current TV campaign in that market. This entry was posted in Politics and tagged Donald Trump, Massachusetts, Tom Steyer. Bookmark the permalink.